This past week several large intercontinental operators including American Airlines, Air France-KLM and surprisingly Dubai based carrier Emirates all announced that in their Boeing 777-ER jets, that they were going to move from a 9-seat (3x3x3) to a 10-seat (3x4x3) configuration, making the seat width an average of 17″ or 42cm. Air France-KLM claimed that the reason to do so was because of more seats in their ‘premium economy’ cabin which takes up more room (bigger seats, more recline) so they had to recoup the lost seats by packing in more customers at the back of the plane. Emirates were more direct: “On a 777, ten-abreast is the way to go,” said Emirates President Tim Clark. “You’d be nuts to do it any other way.” quoted in the Wall Street Journal. The decision by Emirates is more surprising than from the other poorly managed, cost-obsessed US and European carriers as it has been known in the past as a leader in better quality economy class product. Their decision is further evidence of a race to the bottom in passenger aviation – which means only one thing for customers – worse experience. But it gets worse, it’s not only the B-777s that are getting the squeeze, the new Boeing Dreamliner 787 – originally configured for a 2x4x2 layout – thereby boasting more room – has been frequently set with a 3x3x3 one. The net result is the nightmare of being the middle customer in three aisles. Both Boeing and Airbus have pushed back against the criticism arguing (correctly) that the airlines determine the configuration of seating not them. Airbus has gone so far as to publicly use the B-777 decision to have a go at Boeing. They recently claimed in a press release: “Personal space isn’t any less personal on a 12-hour long-haul flight.” Yet the airlines aren’t listening it would appear. On Airbus’ leading planes: the A-330, A-380 and the soon to be launched A-350, they have offered the possibility to airlines to reduce seat with to the same measly 42cm (17″). The world’s biggest passenger airplane, the A-380 can accommodate in economy class 11-seat rows (3x5x3)! The future is becoming dreadfully clear – if you are a price conscious customer, expect to packed in like sardines for your long-haul flight. If being treated like cargo isn’t your idea of a pleasant experience, choose to pay a lot more for a “premium economy” seat. Ironically, twenty years ago, these “premium” offerings were standard economy. From a strategy perspective, there has to be an opportunity for a carrier to buck the trend and position themselves deliberately so. Whether airline executives would have the vision to do so is highly doubtful based on past decisions. Welcome to “cattle class”, in every sense of the word! However besides the economics of it, I have one concern though for packing so many passengers into such a tight environment – would the passengers be able to evacuate quickly enough in an emergency? I once heard that there was a minimum time that an aircraft must be evacuated in an emergency in order an the aircraft to be certified. If another disaster on the lines of the Hudson River A320 crash or the recent B777 in San Francisco were to reoccur but with the passengers packed in like sardines in a tin, I shudder to think that an orderly evacuation would indeed take place. Interesting question Adrian. Never thought of that issue. 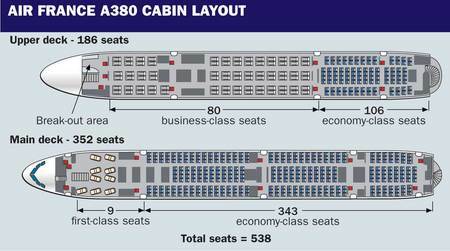 You would think that Airbus/Boeing would take that into consideration when permitting 10 and 11 seat layouts. Thanks for the post! Thanks for this Adrian! It looks like 10 or 11 across will become standard soon.